The online grocery store business is booming in India, thanks largely to an ever-increasing number of people opting for the convenience of using their smartphones to purchase their groceries online. It is also one of the biggest success stories of India’s fast-growing e-commerce sector which is set to be valued more than $100 billion by 2020. The online grocery market in India operates on a highly-competitive platform with multiple players fighting it out for the $900 million pie. Yet as per a report by consulting firm Praxis Global Alliance, this market is expected to grow at 70% CAGR to reach $7.5 billion by 2022. It’s a growth trend driven mainly by large, pan-India corporate players with deep pockets which include the likes of Big Bazaar, Grofers and more recently Amazon. Having said that, this online business also offers many opportunities for smaller, individual players who wish to set up their own grocery store online to cater to a more localised customer base. So how does an individual go about setting up his/her online grocery store business in India? Well in response to this question we have listed below a complete set of guidelines and handy tips that will be useful to you if you wish to become a part of this booming industry. 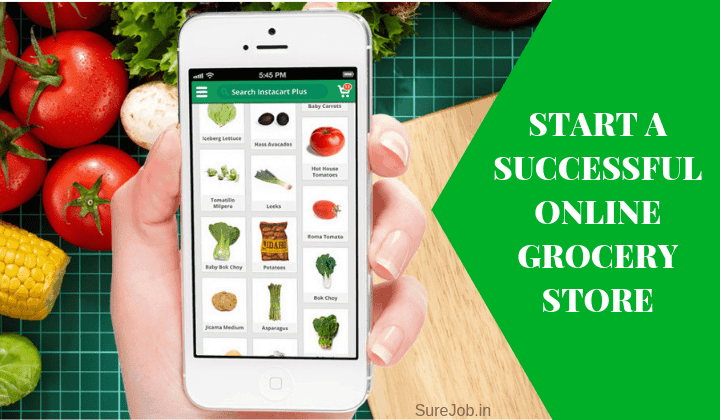 How To Start Online Grocery Business in India? This is the first thing you need to do to start a supermarket business. Fruits, vegetables, milk, pulses and other grocery staples being highly perishable items have a limited shelf life and a small delivery radius – if they are to be delivered fresh. Hence you need to plan your delivery periphery accordingly, to ensure that the items ordered by your customers can be delivered quickly while maintaining the highest quality standards. Identifying the eating habits and buying patterns of the people who stay in this zone is also equally important. It will enable you to identify which items sell faster and spot emerging trends well in advance thereby allowing you to stock fast-moving items in advance and minimising the chance of wastage. Now that you have your location and potential customers mapped out you may need a warehouse to store the products/produce which you will be selling online. Opt for a space located within your territory or as close as possible – to ensure prompt delivery of items to waiting customers. Alternately you can identify, initiate a tie-up or partnership arrangement with reliable suppliers and wholesalers. They can keep you well supplied with the products and items you need on a regular basis. Since you will be buying most of the items in bulk and on a regular basis, you can easily negotiate the rates and ask for a volume discount. This is a crucial step in the whole process of setting up your own online grocery store. If you’re an individual, you can register your company as a proprietary concern, or opt for a partnership registration in case you have partners. You can take the help of any recognised tax consultant or chartered accountant to help you complete the registration and relevant GST formalities. Once your registration formalities are complete, you can then open a business account at any bank of your choice. The success of an online grocery business relies heavily on how fast you can deliver the items to your customer’s home/office. This makes setting up an efficient delivery system a critical factor in the entire start-up process. In India most customers prefer the same day delivery – more so in the case of food and grocery items – and any untoward delay in this particular segment is usually frowned upon. However many times this is not possible solely due to a lack of human resources or the unavailability of vehicles to transport the goods. Deliveries also tend to come at a vast cost-to-company, accounting for nearly 30-40% of the overall business expenses. So what is the best option for you to pursue under these circumstances? If your delivery radius is within 5-8 km from your base of operations, your best bet would be to use delivery boys with their own two-wheelers. Yes, it’s the same model followed by a host of popular pizza delivery chains too. Its’ fast (given the horrible traffic conditions during peak hours), usually dependable and works out quite reasonable in terms of the cost and fuel expenses. To be successful an online grocery business has to rely heavily on the efficiency of its home delivery system. Confirming an order and then not being in a position to deliver it to the customer on the same day can cause irreparable harm to your online grocery startup – so it’s best to avoid such pitfalls if you can. Now that you have all the delivery-related issues under control, we come to another crucial link in learning how to start online grocery business in India. This involves developing and starting a website – which will be the face of your online grocery business. To get this done, you need to first mould your ideas and refine your concepts well enough to fit into a digital format like an online website. Having an efficient and functional website can help you save money on multiple fronts including office rent, power bills and staff salaries. This makes it a win-win situation for both you – the business owner and your potential customer – since you can afford to sell him stuff on lower margins. So do invest some time to think about it and entrust the development of your grocery website to experienced web design and development company only. Make sure you are a part of the entire process right from ideating about the website design, finalising the content to choosing the best e-commerce template for your grocery website. From a customer convenience perspective, besides, being quick to load, easy-to-use and mobile friendly, a smart and efficient grocery website can also emphasise on several extra features. The ability to search for products using generic keywords like potatoes, mustard powder, cooking oil, milk etc. Allow customers to filter products on specific parameters like; offers, quantity, brand and expiry dates. List the best-selling products across categories based on past trends. Contain relevant, high-quality content like cooking recipes for example and offer loyalty programs, discount coupons and reward points from time to time. Announce lighting deals and special offers regularly to boost customer retention. If your budget permits it, you can even consider developing a mobile app for both Android and Apple devices. Don’t forget to give Rs 100 to Rs 200 for first time customer. Just make sure it has a user-friendly User Interface and is clutter-free – to encourage customers to use it more often. If you do have a reliable doorstep delivery system in place, the best option for you would be to stick to the COD or Cash on the Delivery system for accepting payments from customers. Your delivery boys can collect the payment for the items they deliver at the time of delivery itself. This will also ensure a hassle-free flow of cash for you from Day One of your business. An added incentive here is that you will not have to wait for the payment as is the case with many online/credit/debit card payment gateways. What’s more, you also get to save on the additional 2.5% deducted by them as transaction fees for facilitating the payment. While big players in the online grocery business like Big Basket and Amazon have the budgets to afford high profile celebrity campaigns on several media fronts, you don’t have to take the same route. Putting an advertisement in the local newspaper. Running a social media campaign. Putting up hoardings at prominent locations in your locality (if your budget permits). Today’s fast-paced lifestyle, tiring commutes and long working hours are among the key factors responsible for making an increasing number of people choose to shop online. Online grocery shopping clearly offers a very convenient option for such customers by saving them both the time and the physical effort needed to shop for groceries. By starting your own online grocery business in India, you can not only offer people in your neighbourhood another convenient online shopping option but also earn a lot of money and become rich in the process.